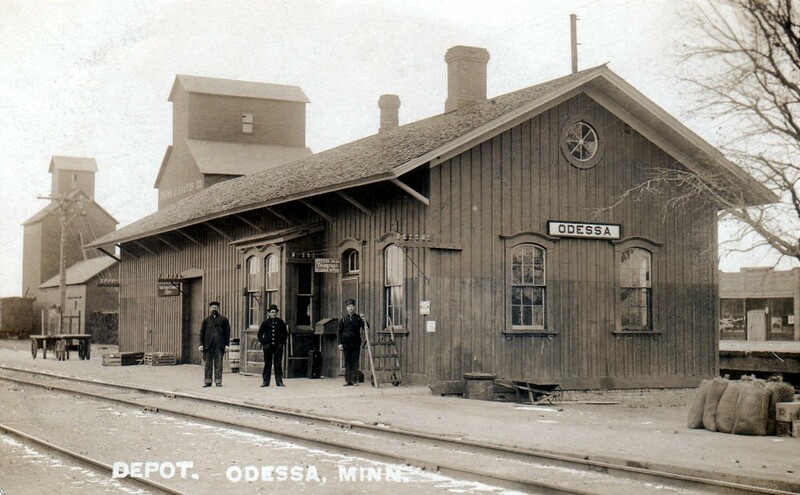 The village of Odessa was located in 1879 by the the first settler, A.D. Beardsley, with the first building being erected in November of that year. In 1882 there were two general stores, a furniture store, a harness shop, a blacksmith shop, a hotel, and an elevator. Mr.Beardsley was an agent with the Milwaukee Depot and also ran a store. J.R. Meier, who learned the trade of blacksmith in his native Switzerland came to Odessa and began his business in 1879. William H Mueller, who in later years everyone knew as “Black Whiskered Mueller”, became proprietor of the Odessa House in February 1882. Sometime later the Odessa House was later used as residence by the Kollitz family when they moved to town from Akron. The Odessa House was later taken over by Mrs. Louis Dougherty, who in turn sold it to Mr. and Mrs. John Edquist, who ran it for many years. It was later known as the Odessa Cafe, and Cha Che’s Cafe. Today it is owned and operated by Kelly and Meagan Hunt, and has been named The White Pony. 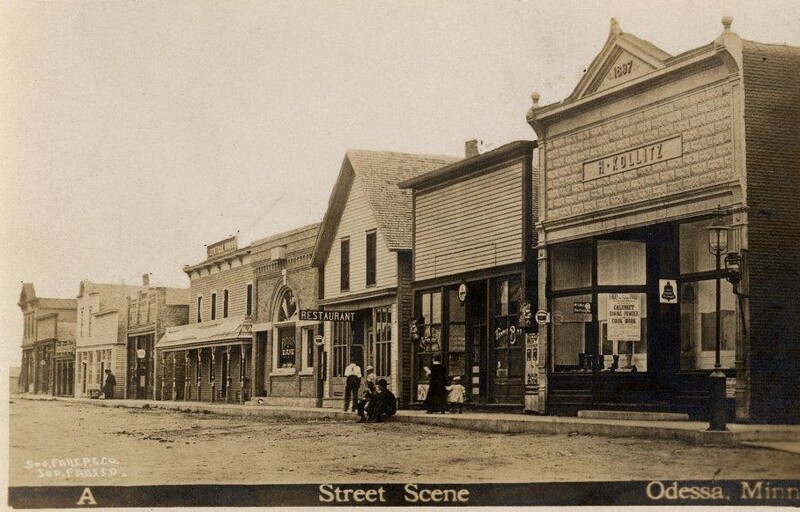 There have been various types of stores in Odessa since the first general store established by Mr. Beardsley. Mr. Wildung, who came to Odessa from Howard Lake, handled both general merchandise and hardware. The first and only furniture store was built and run by Pearson and Englemann, which sometime later was taken over by J.W. Lenz, who operated it for many years. As for general merchandise stores, the names Menzel Bros. and Kollitz are remembered in Odessa history on account of the length of time their businesses continued to serve the people of the community. In the early days, Odessa was a typical small town, small in size, but large in comparative business places, and none should be omitted as they were a credit to the village at the time they were in operation and each helped to keep up the prestige as a reliable “shopping center”. Mr. Beardsley had a daughter, Dessa, who died of diphtheria at the age of three, it it was after her that Mr. Beardsley named the Village. Julius Held became depot agent in Mr. Beardsley’s place when he moved to a farm in 1881. The Odessa Fire Department was organized in 1908. The first known pieces of equipment were two wheeled carts that were pulled by hand. Chemicals used for the firefighting were soda and acid. The wooden building housing the equipment stood north of the old village hall. The bell atop the building was a clapper type that had a sound of its own. None other could match that mournful sound when it rang. Monthly meetings were held. Members received fifty cents per meeting and $1.00 for each fire they attended. If a member was absent, he was fined fifty cents. Roll call was taken after a fire run. The first motorized vehicle that can be recalled was a 1930 model tank mounted on a 1918 Buick chassis with no cab on it, strictly an open air fire truck. The first fire after the motorized equipment was used was a roof fire on the Milwaukee Railroad Depot. It was quickly distinguished with this latest piece of equipment. In 1936 the first new truck ever purchased by the department arrived, it was an International truck. A major fire struck the village in 1939 when the Olson and Edquist Store and Menzel Hardware went up in flames and burned to the ground. (That is now the lot north of Tom’s Service Station.) There are memories of how kids were frantically pumping water from the town pump to help the firemen battle the blaze. the Ortonville and Appleton Fire Departments were also called. the emphasize, the size of this fire – a banner headline in the Minneapolis Journal stated: $15,000 Fire Hits Odessa, Minnesota —Headline News in 1939. Another fire that certainly stands out in the memories of all was the early morning fire that completely destroyed the Odessa Farmers Elevator of Sunday, August 6, 1978. It will long be remembered as the most costly fire $1,000,000.00 that ever struck this village. There were many visitors to Odessa that early morning and the weeks that followed as the flames died down and clean up efforts continued. Due to the generosity of the local farmers and townspeople, a new steel type building was erected the summer of 1979. Even though the current department remains independently owned, it has had it’s challenges. Most municipalities own their own fire departments allowing those departments larger budgetary constraints. Since the Odessa department is independent, all operating funds are raised through fire protection contracts, and through fund raising efforts. Currently the fire department, known as Odessa Farm Fire Department, consists of both men and women firefighters. In 2008, the fire department moved into the new fire barn located at 111 E First Street, in the village of Odessa.